Unlocking the Mystery of Electronic Bidding - Eventful Inc.
Smart phones dominate business today. You use your smart phone to do banking, get directions, look up a website, pay for a store’s purchases, download a coupon for a retail purchase, and an endless slurry of additional tasks. With the avalanche of applications for smart phones, it doesn’t seem implausible that the smart phone would help guests purchase items or donate money at a charity event. But what does this really mean? Is the smart phone really helpful in increasing efficiency or in increasing the funds raised? Or is it just cool to say that your event is using electronic bidding? These are legitimate questions, and ones that deserve an answer. Let’s start with the basics, and simply define electronic, or mobile, bidding. Electronic Bidding is a simple concept. It is a process of bidding without paper bid sheets. So, instead of writing down your bid on a paper bid sheet, you are completing a bid on an electronic device—your cell phone. If there aren’t paper bid sheets, then all of the item descriptions and bid increments will appear on the screen of the electronic device. Guests won’t have to hover around the auction display tables when there is a competitive battle for an item. They will also be notified when another bidder outbids them. This keeps them engaged in the bidding war, no matter where they are standing during the silent auction. The bidder can continue to raiser the bid without racing back to the item right before it closes. 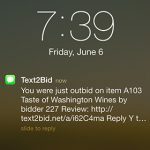 In our experience, some bidders get caught up in a conversation with friends during the cocktail hour and don’t return to the Auction tables before they close. Or, they don’t want to stand around the tables because there is too much congestion in the area. Bidding wars are lost just because it is difficult to stay engaged. This is why electronic bidding is so efficient when it comes to fundraising events. It keeps guests engaged through the entire auction. The Eventful Company offers the use of electronic bidding through MaestroSoft’s Text2Bid software. 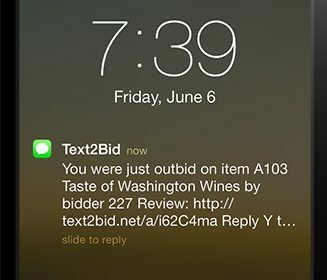 Although their standard AuctionMaestro software is already very effective, Text2Bid makes everything even easier for everyone. Not only can guests bid on silent auction items at an event with Text2Bid, but they can also make other event purchases or donate to the event’s fundraiser. To see how MaestroSoft’s Text2Bid Works, check out the video below.